Please, repost this information to save lives of Ukrainian soldiers. “Dear Friends, THIS IS AN URGENT CALL TO ACTION. ONE CELOX EQUALS ONE LIFE!! The Ukrainian Army and Hospitals are in desperate need of our help. Unfortunately, Ukrainian soldiers lack many life saving supplies in the ongoing military conflict in the Eastern part of the country. One of the greatest needs is CELOX which is not available in Ukraine. CELOX STOPS BLEEDING AND SAVES LIVES!!! 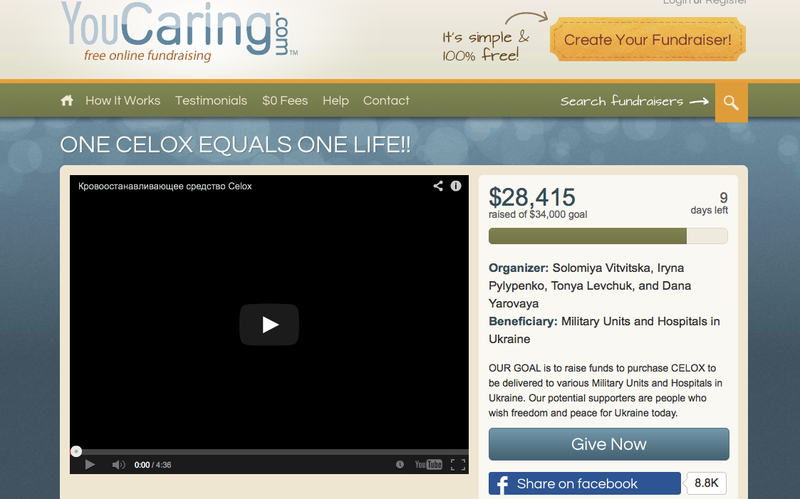 This entry was posted in English, Help for ukrainian army, Languages, Media, News, Petitions, Pictures, Regіons, South&Eastern Ukraine and tagged #Celox, #fundraising, #RussiaInvadesUkraine, #warinukraine, army, donations, Ukraine, Ukrainian Army. Bookmark the permalink.